Beefy Nacho Soup - ready in 15 minutes!! Ground beef, taco seasoning, cheese soup, black bans, Rotel, milk - top with more cheese, tortilla chips and sour cream. This soup is ridiculously good! I love that it only takes about 15 minutes. Use mild Rotel if worried about the heat. If you follow the blog, you know that I love to incorporate Campbell's Soup into dishes for quick weeknight meals. I always have several cans in my pantry. They really make dinner easy and delicious! I recently picked up a can of Campbell's Fiesta Nacho Cheese Soup. I wasn't sure what I would make with it when I bought it. We've really been into soup lately, so I came up with this Beefy Nacho Soup. This soup takes about 20 minutes from start to finish. You can't beat that! 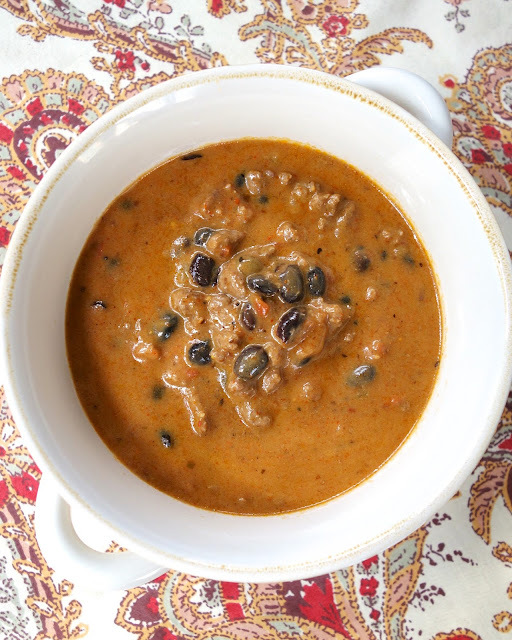 The soup is crazy delicious and is guaranteed to please the pickiest eaters! Taco meat and cheesy soup - what's not to love?! If your picky eaters don't like chunks of things in their soup (like me), pulse the diced tomatoes and green chiles in the food processor before adding them to the soup. I also suggest using mild diced tomatoes and green chiles if you are worried about the heat. We used regular and it made Chicken Legs' nose run. If you’re cooking dinner, Campbell gives you fresh ways to delight your family. I am always checking out Campbell's Kitchen.com for fresh twists on classic dishes and totally new recipes. With the help of The Wisest Kid in the Whole World™, Campbell’s soup is offering delicious recipes your kids won’t be able to refuse! Who doesn't need more fun, quick meal ideas?! In 2-quart saucepan, brown ground beef over medium-high heat until thoroughly cooked; drain. Reduce heat to medium. Stir in taco seasoning, Fiesta Nacho Cheese Soup, black beans, diced tomatoes and green chiles and milk. Cook 8 to 12 minutes or until thoroughly heated, stirring frequently. Top individual servings with shredded cheese, sour cream and tortilla chips. Nothing like a hearty soup to warm you up in the winter! I'm so lucky my kids love to eat soup because this will definitely make an appearance at our table! this looks so good!! 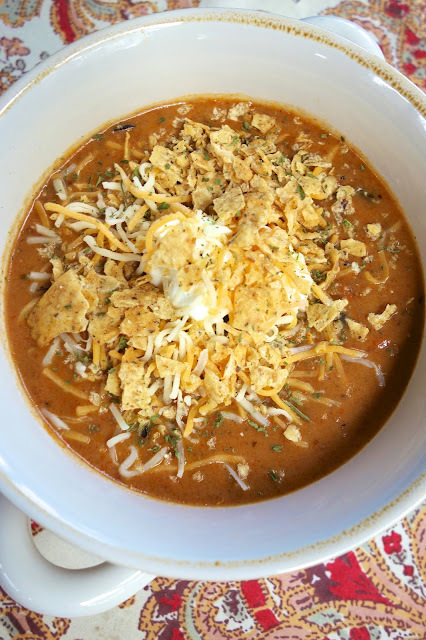 i use the fiesta nacho cheese soup when i make chicken enchilada casserole ... delish! I'm totally making this! YUM! I hate to tell you this but the sodium in this meal is awful. And not good for you. It is an interesting concept and needs to be made a little healthier for me. We are in major soup-making mode around here. It must be all the snow. I love spicy soups like this one! Sounds quick, easy, and crowd-pleasing! This will definitely be making an appearance at my dinner table! This looks like such a incredible soup, can't wait to try it! I tried to save this with Ziplist, but it says the link doesn't work. Just an fyi. I am definitely trying this...my son will love it! I just tried it and it saved it to my Ziplist recipe box. It might have just been a glitch on their end when you tried it. The soup sound good and easy. I tried to print the recipe, but the link "Printable Recipe" doesn't work. I fixed it - thanks! This is right up there with the Taco Soup, which we absolutely love. Thank you for another great soup recipe to add to my arsenal. Can't wait to make it again. I have pics on my profile page.